Is there a better alternative to TriMicSlots? Is TriMicSlots really the best app in Card and Board category? Will TriMicSlots work good on macOS 10.13.4? 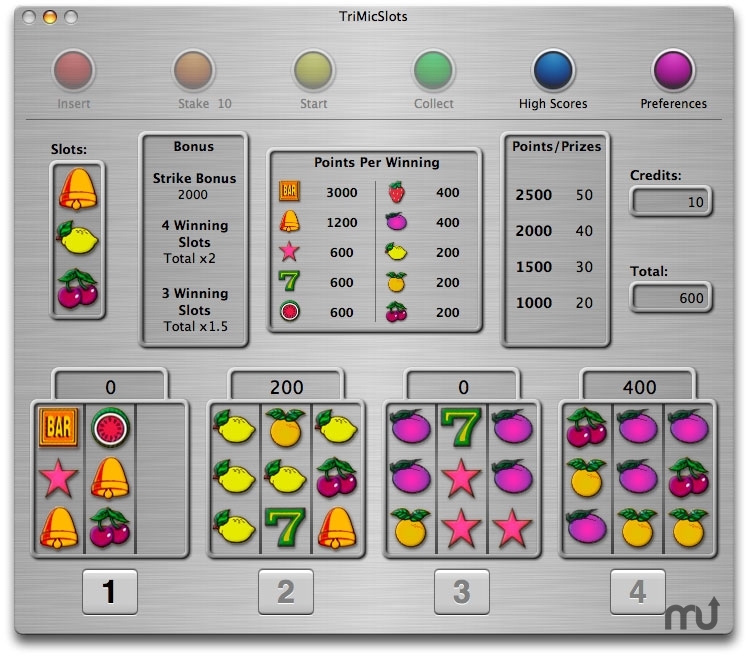 TriMicSlots is a remake of the popular Slots arcade game introduced in the 90s in Europe. The arcade game was banned shortly after its introduction, because it was too addictive. TriMicSlots also is a newer variant of the original Slots game, yet even more exciting since less luck and more tactical decisions are involved. From a technical point of view, TriMicSlots is an object-oriented AppleScript Studio application. Our goal was to prove that you could do anything with AppleScript, even building a game! We've been very exciting to create this project and we hope you will have as much fun as we had building it. Added an "Auto-save" option in the save dialog. Updated and optimized the TriMicSlots Help. TriMicSlots needs a review. Be the first to review this app and get the discussion started! TriMicSlots needs a rating. Be the first to rate this app and get the discussion started!